Fully guided trophy mule deer hunts on the famed Kiabab and Arizona Strip. This outfitter has been guiding these units since the 70's. It is tough to find anyone with this much experience in these areas. OTC late season archery rut hunts are also available. 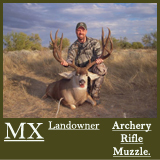 Fully outfitted and guide only hunts for trophy class mule deer and Coues deer. Tags for both species must be drawn, but the Coues tags require few if any points to draw. Private land (RFW) as well as drawing public land hunts are offered by this outfitter. Choose the all inclusive fully outfitted option or the guide only. Some public land hunts require many points to draw while others require very few if any. Unit 481 landowner vouchers and a guide is not required. Hunt on the ranch and all the surrounding public lands. Camping is welcome on the ranch. The landowner also offers a modern fully equipped guest house for rent for those wanting to stay in comfort rather than a tent. Private land Iowa Whitetail deer hunts with trophy quality bucks. This outfitter has multiple exclusive hunting leases to hundreds of acres of private land in the trophy producing zones in southern Iowa. Fully outfitted hunts with exceptional pricing. 150,000 acres of private land with tags that are near guaranteed. Hunt duration is 5 or 6 days depending on weapon choice. Most bucks are mature 4x4 with some exceptional trophy quality. With some planning these hunts can be in combination with a pronghorn. 300,000 acres of private ranches managed by a big game biologist. Each ranch is hunted only once per year. Trophy class mule deer that rival the quality anywhere mule deer live. .
A 10,000 acre private ranch provides excellent deer habitat that produces very respectable bucks. 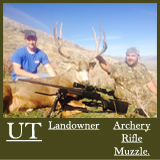 Landowner vouchers guarantee hunters the necessary tags and a guide is not required. 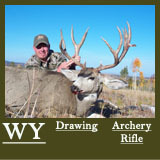 Archery and Muzzleloader hunts are available. .
Over 20,000 acres of private land in northwestern Utah. Very high success rates with good quality bucks. November rut hunts are available. These landowner vouchers are valid on a 22,000 acre ranch in northern Utah. Hunters can choose any 5-day period beginning in early September through early November. Camping is allowed on the ranch and ATV's are recommended. It is well known that Wyomings region H holds some boomer bucks. 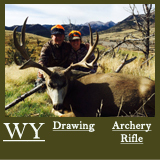 This outfitter is highly sought after as he consistently produces better than average bucks year after year in this part of Wyoming. Hunters must book early as all slots are usually filled prior to the application period. This outfitter hunts over 60,000 acres of leased private ranches. Total hunters are kept to a minimum to insure a quality experience as well as provide quality animals. Tags must be drawn, but 1 point in the standard drawing should be enough to guarantee the tag. Trophy class mule deer or whitetail on the eastern slope of the Absaroka Range. Stay on a private ranch in their modern hunting lodge or in an extreme wilderness horseback camp. One or two points are typically enough to guarantee a tag for this hunt. Guaranteed tags with good trophy potential. Hunt early November during the pre-rut and the start of the annual mule deer migration to the winter range.